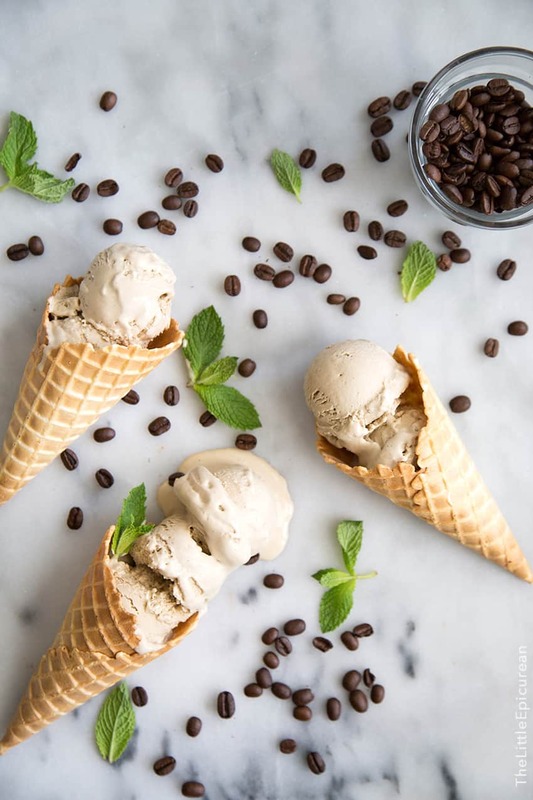 Mint mojito coffee ice cream: a frozen, sweet, and creamy way to cool down this summer! 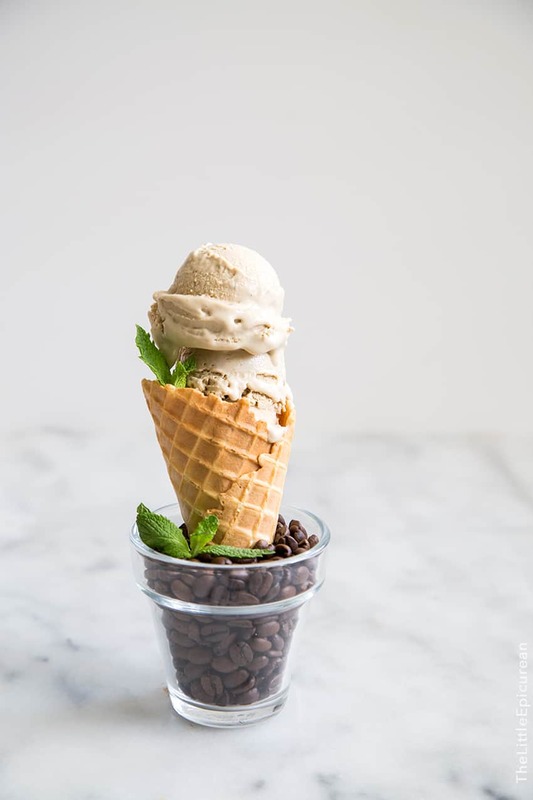 Summer also means ice cream. Loads and buckets and many scoops of ice cream. 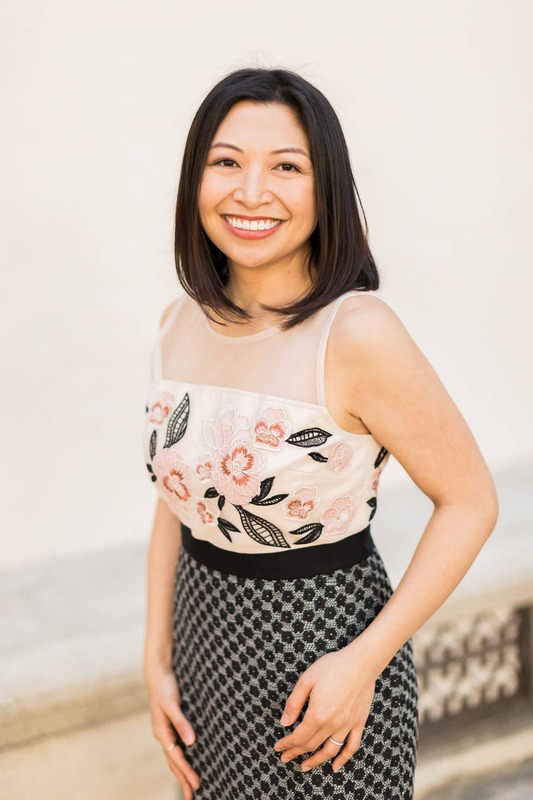 Have you heard of Philz Coffee? I fell crazy in love with their popular sweet and creamy mint mojito iced coffee a few years ago. While Philz originated in the Bay Area, they’ve made their way south! Locations are popping up all over LA. Don’t let the name fool you. 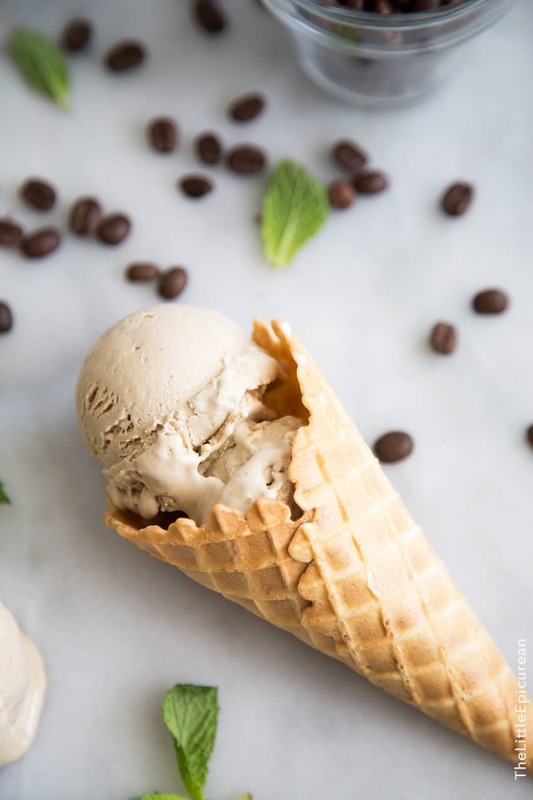 This mint mojito coffee ice cream is alcohol free. It’s basically coffee amped on mint. It may sound like a strange combination but it’s surprisingly delicious. The mint balances out any bitterness in the coffee. It makes the coffee taste super smooth and mellow. Fresh mint tastes a world of difference better than any of that artificial mint flavorings. In a medium pot, bring cream, milk, and 2 Tbsp sugar to a boil. Microwave coffee beans for 30 seconds. Once milk boils, remove from heat. 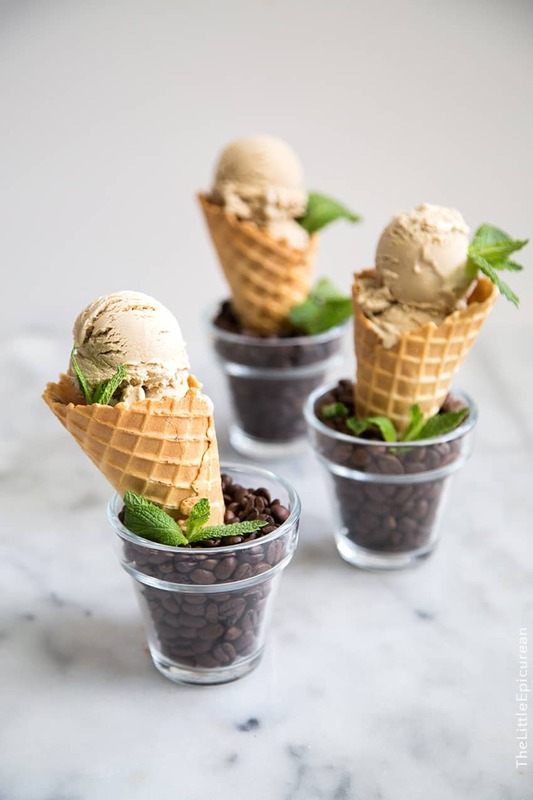 Add warmed coffee beans and torn mint leaves. Stir together. Cover pot and let steep for 45 minutes. Strain liquid mixture and discard coffee beans and mint leaves. Place pot of milk over medium heat and bring to a boil. In a large bowl, whisk together egg yolks and 1/4 cup sugar. Once milk begins to boil, lower heat. Temper hot milk mixture into sugar-yolk mixture. Slowly add hot milk into yolk mixture about 1/4 cup at a time, whisking to distribute heat. Continue to add milk into the yolks. Once all the milk has been added, transfer everything back into the pot. Continually stir over medium-low heat until mixture reaches nappe consistency, or 180 degrees F on a kitchen thermometer. Let mixture sit at 180-185 degrees F for a few minutes to pasteurize eggs. Remove from heat. Add espresso powder and vanilla. Stir until espresso powder has dissolved. Pour mixture into a plastic wrap lined sheet tray. Spread over the tray and cover with plastic wrap. Let cool in the freezer for 5-10 minutes until mixture has cooled to room temperature. Transfer to an airtight container and let mature in the fridge overnight. 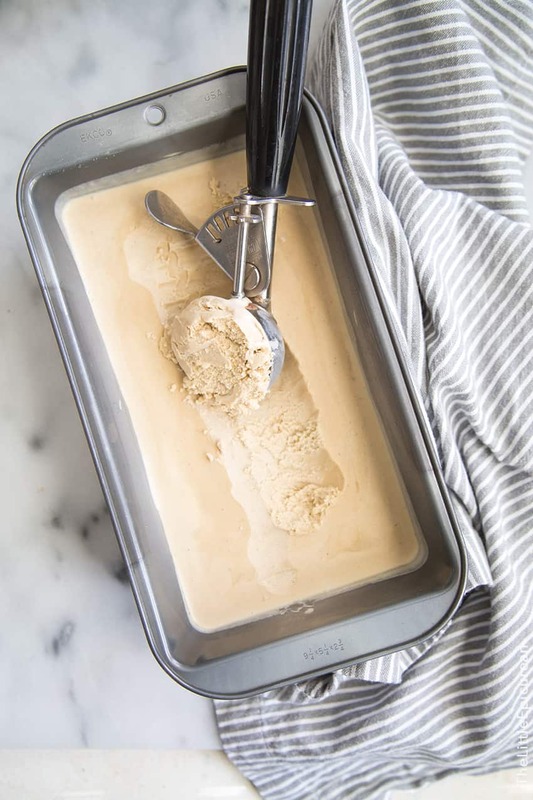 Freeze mixture in ice cream maker according to your unit's instructions. Once the volume has increased by half and has reached a soft serve consistency, transfer mixture into a freezer safe container. Let chill in the freezer for at least 2 hours before serving. Thanks Annie! I was hesitant about the combo at first, but coffee and mint are really amazing together! I’ve never heard of Philz before, but as soon as I get to LA this summer I am totally hunting them down. This sounds incredible and so refreshing for summer. 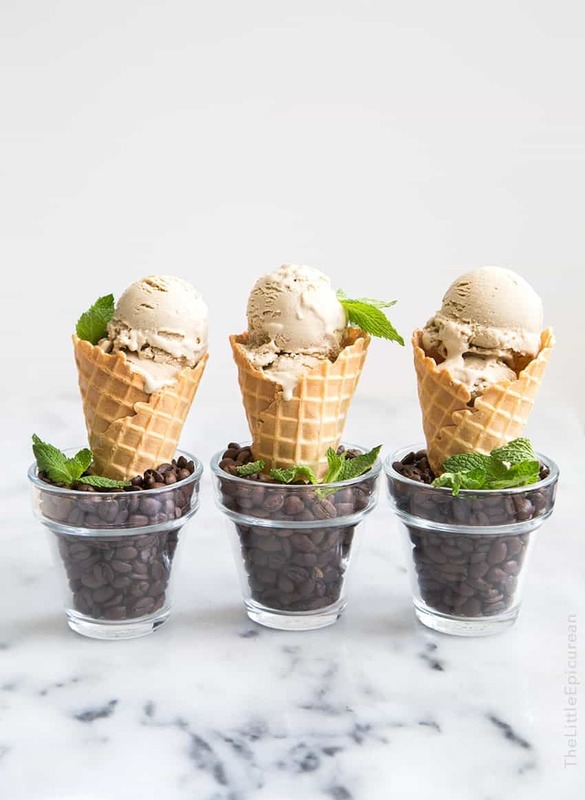 Coffee ice cream is my favorite and I love mint so them together just makes sense! Thank you so much for joining in on ice cream week with me!!! 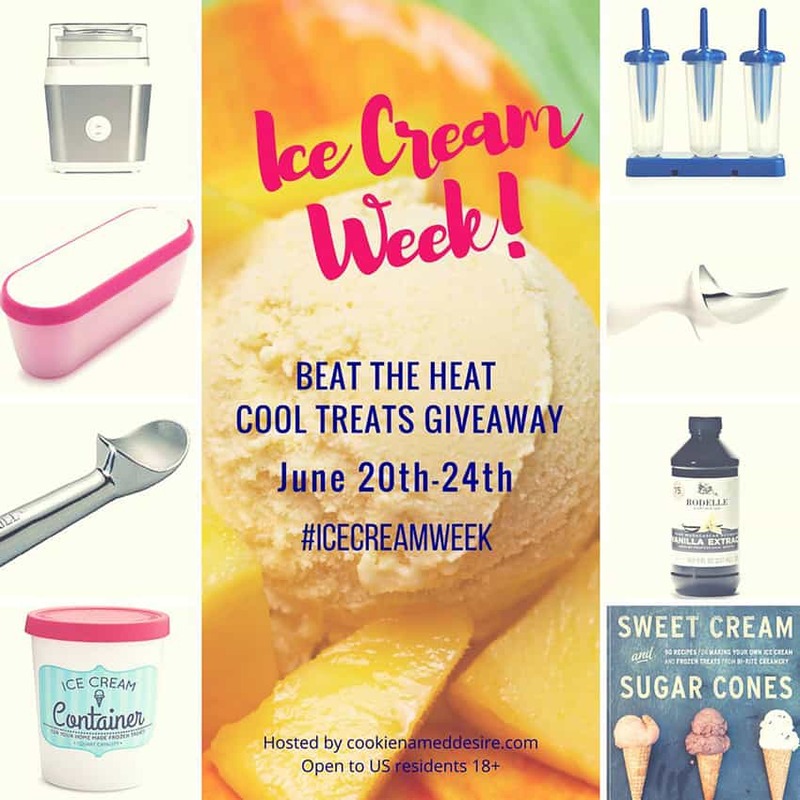 Thanks for bringing Ice Cream Week to life! Ahh, you’re visiting LA this summer?! Yes, definitely stop by Philz. It’s great!